Archaeopteryx is the basal bird, the sister group of Rahonavis and the Pygostylia (Chiappe, 2002b), which includes all other birds (see cladogram). The Pygostylia, consisting of the Confuciusornithidae and the Ornithothoraces, share the pygostyle (fused caudal vertebrae) and a backwards-pointing pubis. 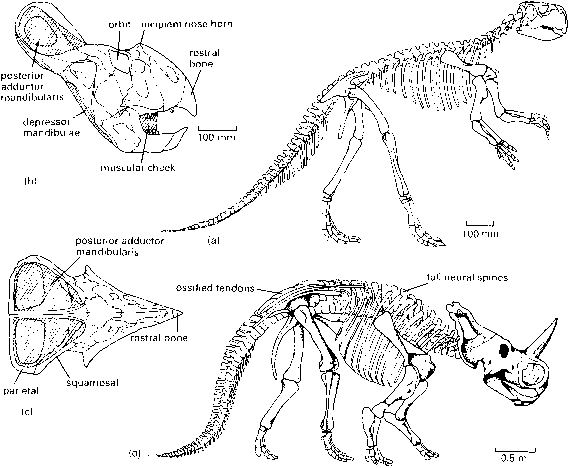 The oviraptorosaurs fit in the scheme next, controversially: they have a pygostyle and other generalized bird characters (Maryanska et al., 2002), as well as other features of the skull, cervical vertebrae and pelvis seen only in more derived birds. The major Cretaceous bird group, the Enantiornithes, shares a number of typical avian characters with more derived forms, and two Late Cretaceous forms, Patagopteryx and Vorona, come next in the phylogeny. 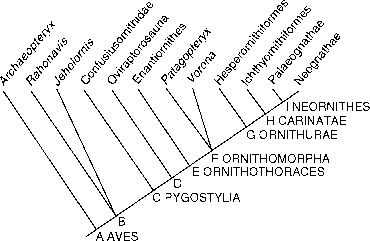 I Cladogram showing the postulated relationships of the major groups of birds, based on Chiappe (2002b). For the location of birds among theropod dinosaurs, see Box 8.5, and for the phylogeny of Neognathae, see Box 9.4. Synapomorphies: A AVES, nostril moved back to lie partially above the antorbital fenestra, prominent acromion process on the scapula, papillae on ulna for flight feathers, pointed and low posterior process of the ilium, reversed hallux (first toe points back); B, procoelous synsacrum, shaft of ulna considerably thicker than shaft of radius, fibula does not reach proximal tarsals, tubercle on dorsal face of metatarsal III; C PYGOSTYLIA, absence of the hyposphene-hypantrum accessory articulation in the thoracic vertebrae, pygostyle, backwards-turned (retroverted) pubis at an angle of 45-65° below the vertebral column, wide and bulbous medial condyle of the tibiotarsus; D, fused premaxillae, lacrimal is curved and open posteriorly, jugal bar slender and rod-like, mobile quadrate-quadratojugal articulation, 13 cervical vertebrae, cervical ribs fused to centra, more than eight sacral vertebrae, ilia that are close together dorsally; E ORNITHOTHORACES, fewer than 13 thoracic vertebrae, strut-like coracoid, triosseal canal, alula; F ORNITHOMORPHA, loss of caudal prezygapophyses, metacarpals 2 and 3 partially or completely fused distally, complete fusion of metatarsals 2, 3 and 4; G ORNITHURAE, sharp pointed anterior process of quadrate, fewer than 11 thoracic vertebrae, procoracoid process, globe-shaped convex proximal head of humerus, small acetabulum, pubis runs back parallel to ischium and ilium, femur with prominent patellar groove; H CARINATAE, extensor process on alular metacarpal well developed, ungual phalanx of major digit (finger 2) absent; I NEORNITHES, teeth absent, quadrate articulates with prootic, gastralia (abdominal ribs) absent, pneumatic fossa and foramen in humerus. The more derived birds, the Ornithurae, include hesper-ornithiforms, ichthyornithiforms and Neornithes, the modern groups (Cracraft, 1988; Chiappe, 2002b). These are all characterized by a pointed orbital process of the quadrate (see Figure 9.8(c)), a shortened back and pelvic elements that run back almost in parallel (see Figure 9.8(a)). Ichthyor-nis shares features of the hand with modern birds. The modern birds, termed the Neornithes (illustration I), are distinguished from the extinct groups by further derived characters (Cracraft, 1988), including loss of teeth and a pneumatic foramen in the humerus that provides access to an air space inside the bone. The air spaces in some major bones both reduce weight and provide air storage spaces so that the efficiency of respiration is improved. The modern birds fall into two clades, the Palaeog-nathae, flightless ratites and tinamous, and the Neognathae, all other flying birds (Cracraft, 1988). The palaeognathous palate (illustration II(a)) has a large vomer firmly attached to the pterygoid, no joint between the pterygoid and the palatine, and a movable joint between the pterygoid and the base of the braincase. 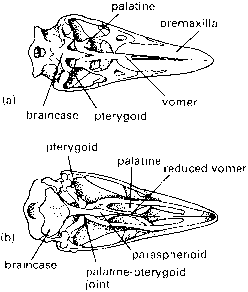 The 'neognathous palate' (illustration II(b)) is more loosely constructed and more mobile. The vomers are reduced or lost completely, there is a movable joint between the palatine and the pterygoid and the pterygoid/ braincase joint has been lost. Most of the Cretaceous birds reported since 1990 may be assigned to positions in a cladogram of early birds (see Box 9.2) as a result of intensive anatomical description of the spectacular new finds, especially the specimens from Spain, Argentina, Madagascar and China (summarized by Padian and Chiappe, 1998; Gauthier and Gall, 2001; Chiappe and Dyke, 2002; Chiappe and Witmer, 2002). Other Cretaceous birds, especially some less complete specimens from the Cretaceous of Europe, are less easy to place. was the size of a raven, it was a flyer and it had an enlarged claw on its second toe, perhaps used for killing prey by slashing, as in dromaeosaurids and troodontids (see pp. 197-8). Rahonavis, although living long after Archaeopteryx, retains the long bony tail and other primitive features that were lost in all other birds. It differs from Archaeopteryx in having a nostril that has moved back to lie partially above the antorbital fenes-tra, a prominent acromion process on the scapula, a pointed and low posterior process of the ilium and different leg proportions. Forster et al. 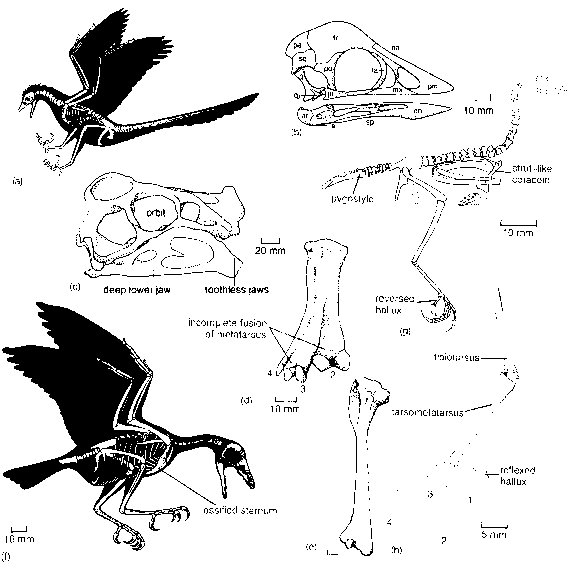 (1998) believed Rahonavis was a close relative of Archaeopteryx, perhaps a member of the Family Archaeopterygidae, but the new cladistic analysis (Chiappe, 2002b) shows that the Madagascar bird differs in at least five characters. Where is the procoracoid foramen. ?